Which is totally true – great shoppers can afford to prepare and serve fantastic, wonderful meals. Shoppers who do not pay attention to items on sale, or are forced to pay top dollar for food basics, cannot possibly serve such amazing meals. So I am a great promoter of having a chest freezer (mine cost $125; it has paid for itself many times over). Living in the province of Ontario, you can buy AMAZING meat deals, and other deals, all the year around. Who on earth would pay $26 per pound for a T-bone steak, when you could get them for $5 per pound on sale, and freeze them? 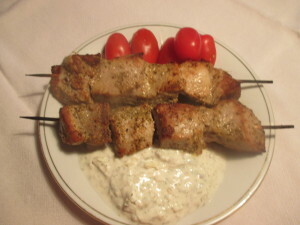 Or who would pay $17 per pound for a pre-made shish kebab, when you could pay less than $2 per pound for the same thing? Check here for my video comparison. Save money, and enjoy better food. What’s not to like? How do you know when the trout are biting? Are there multiple Ford F-150s parked in the lot of the Samuel Wilmot Nature Area? YES!! The likelihood of catching a giant 10-pound Rainbow Trout in Lake Ontario appears to be directly proportional to the number of Ford F-150s in the parking lot. Which I know because I talked to one of the F-150 driving fishermen today; he caught five but only kept one, the ten-pounder. “PLEASE can I get a picture?” I pleaded. “I’m sorry, he’s all packed up in the back, and I have to take my dad to the eye doctor,” the fisherman apologized as he dashed off. Darn.